Certain countries have visual and characteristic motifs that if one were to make a parody, or homage, of the cinema belonging to that nation it would be easy to fall back on these tropes. A non-indigenous director filming in England might shoot his subject so as to feature shots of Big Ben, Buckingham Palace and such a movie could potentially star an upper-class man who struggles to express themselves (see every Woody Allen film made in England); a film set in Spain might, for example, feature the presence of heat and an equally hot-tempered Latino passion (see Woody Allen’s Vicky, Christina, Barcelona). Using similar shorthand techniques and stereotypes, someone composing a South Korean film would certainly start their movie with scenes of bloody violence and uncontrollable tears; wild emotions caused by the decline of Confucian beliefs in an increasingly selfish world. 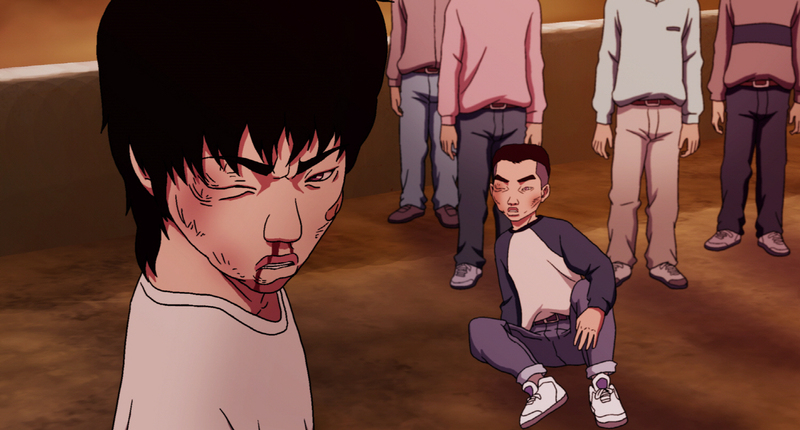 Yeun Sang-ho’s animated South Korean feature The King of Pigs begins with such an instance of bloody violence and uncontrollable tears. Kyung-min (Oh Jung-se) is a businessman whose company has begun to experience difficulties; in retaliation to this, and the stress of his life, he kills his wife almost impulsively. In order to make sense of his own actions, violence and rage, Kyung-min shields his anger and arranges to meet, for the first time in some while, his middle school classmate Jong-suk (as voiced by Yang Ik-june, the mind behind the modern Korean masterpiece Breathless) - will looking back on their school days, and the bullying they endured, make any sense of their current lives? Could the rigid hierarchies and suffering of their youth help to explain how they have become moulded into rage-filled men, looking to recast themselves from the roles of victims to victimisers? The majority of the tale takes place in flashback as the duo recall their school years which, to a large degree, seems to resemble a nightmare-ish take on The Lord of the Flies - children self-govern along self-imposed castes with anyone standing up to the order quickly given psychological and physical retribution. The one child who refused to live within the confines placed upon them is the one who may have the least to lose -Chul-Yi, the centre of many of Kyung-min and Jong-suk's reminisces, is strictly anarchic with his manner. Yet no one man can be an island - his fate is to be a tragic one. The King of Pigs, a film which is as subtle as the laboured animal metaphors throughout the movie, is yet another brutal look at the pervasive violence in pockets of South Korean society: an area which has been covered (with greater maturity, power and emotion) by a large array of other features from the region. Yang Ik-june's presence in the cast, for example, is a reminder of such a movie; the much more eloquent and visceral Breathless. That the topic is a much discussed one in Korean cinema would matter much less if the characters within King of Pigs were a bit more rounded rather than playing up to character tropes and national stereotypes with little fluidity - one of the few obvious problems in a feature which also boasts some of the most bizarrely translated subtitles I have known. Yet, despite it's myriad of flaws (which are obvious and plentiful) King of Pigs somehow manages to become a genuinely gripping movie at points with much to admire. The lack of sophistication in much of the animation is actually one of it's strengths; a perfect aesthetic representation of the crude and brutal society it is trying to represent. Similarly too, a number of set pieces are incredibly inventive with the hallucinatory scenes in particular being highlights of the movie - a murdered cat, chastising and haunting with biting comments is a grand moment for example. With it's violence, sorrow, Han, and occasional propensity for the utterly inventive, King of Pigs is, in short, the most ultimately box ticking of all Korean films. It's a feature which is filled with elements of the national character and it's cinema but, like Match Point or any other Woody Allen abroad films, the movie seems to lack a genuine heart; it doesn't always ring true. Whilst on paper the subject matter may be profound, there is little to be said here with any nuance or spirit; individual moments and scenes glisten and thrill but, ultimately, the whole is much less than the sum of its pieces.